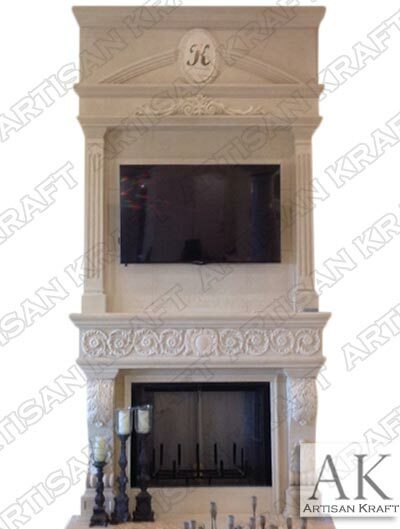 The Italian Traditional Overmantel is pictured here in cast stone. There are images in this category of it carved from marble. This surround goes all the way to the ceiling. Leaf corbel legs below a circular flower design mantel shelf. Two fluted pilasters hold the second shelf with and arch above it. A trim molding comes right up to the ceiling. The precast color is white in this fireplace but it can be made from different colors. Call in for pricing.